Our product range includes a wide range of marking machine handy coder and batch coder mini printer. 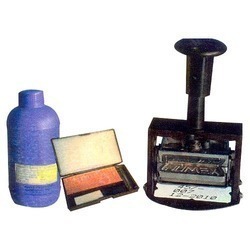 Owing to our immense expertise, we have been able to bring forth a wide spectrum of Marking Machine Handy Coder. Operates on SS round flanges, this range has low maintenance and hence widely demanded by the clients. 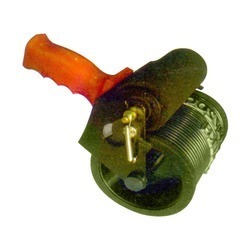 These machines are developed employing qualitative material, which sustains their tensile strength and durable finish. Further, the machines delivered by us are examined in our quality control unit to ascertain their flawless operation. Batch Coder Mini Printer which is a reliable hand-operated self-inking Batch Coder for manually coding numbers etc. in one stroke on flat / round, metallic / non-metallic surfaces on pouches, tins, caps, glazed or plain labels, laminated cartons, bottles (curvature), etc. These Batch Coder Mini Printer kits are like mini printing shop in your office or factory. Make your own instant rubber stamps whenever you need it.The message to be printed is very easily composed by just push fitting the metal numbers (easily changeable) on to the groove base mat. The Inking system consists of a rechargeable felt pad, which is fully enclosed allowing the use of fast-drying & indelible solvent-based inks for porous and non-porous surfaces. Looking for Marking Machine Handy Coder ?